Dark money groups are spending significant sums on behalf of Rep. Ed Markey’s (D., Mass.) bid for the Democratic nomination for the U.S. Senate, despite his stated opposition to such groups and a pledge to restrict their role in the race. 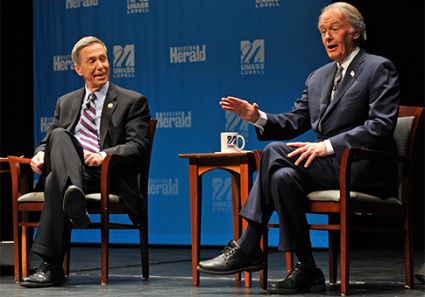 Markey has been a vocal opponent of the Supreme Court’s decision in Citizens United vs. FEC, which eased restrictions governing the speech of corporations, labor unions, and nonprofit groups. He compared the court’s Citizens United ruling to the infamous Dred Scott decision, which classified slaves as private property. Third party independent expenditure groups are spending large sums on Markey’s behalf despite his distaste for the post-Citizens United campaign finance landscape in the special election for the seat vacated by Secretary of State John Kerry. Independent expenditure groups have spent nearly $1.3 million on the contest for the Bay State’s Democratic Senate nomination. About 93 percent of that tally has gone to Markey over his opponent, Rep. Stephen Lynch. Lynch and Markey agreed to oppose all political advertisements funded by third party groups. In their "People’s Pledge," the two Democrats said they would donate 50 percent of the total cost of any independent expenditure ad to the charity of their opponent’s choice. The $90,000 spent on advertisements by a group called the NextGen Committee, run by billionaire environmentalist Tom Steyer, violated the pledge, and Markey’s campaign has said that he will abide by the pledge’s consequences. However, hundreds of thousands of dollars in independent expenditures on Markey’s behalf have supported efforts other than political ads, providing a "loophole" for him to avoid running afoul of the pledge. "The so-called ‘People’s Pledge’ appears filled with loopholes favoring labor unions, and apparently exempting certain forms of communications like door-to-door canvassing, telephone calls, and email communications," said Jason Torchinsky, a partner at the campaign finance law firm Holtzman Vogel Josefiak PLLC. The labor union exemption comes in the form of member-to-member communications, which are not considered independent expenditures. Significant political activity by large unions can therefore go unreported. Independent expenditures in support of Markey include "copy, art & production" and "list rental" by the group NARAL Pro-Choice America, a 501(c)(4) advocacy group, and canvassing and polling expenditures by the environmentalist group League of Conservation Voters, also a 501(c)(4). Those two groups, in addition to the Service Employees International Union, the environmentalist 350.org Action Fund, and Steyer’s NextGen Super PAC, have independently spent a combined $1.17 million supporting Markey, according to the Sunlight Foundation. Most of that sum has fallen outside of the pledge’s prohibitions on communication-related expenditures. Dan Backer, principal attorney at the campaign finance compliance firm DB Capitol Strategies, said the nature of the "people’s pledge" leaves Markey with ample opportunity to benefit from independent expenditures. Markey benefits by design due to the pledge’s focus on communications, which Backer said are unreasonably presented as uniquely damaging to the democratic process, in contrast to independent expenditures that support other activities. "The loophole isn’t a loophole," Backer said. "It’s just one of many obvious flaws in what is an underlying stupid idea—that only candidates have something to say about their races and that everyone else should shut up." "If Markey where serious he would take the Roemer Pledge, and only accept contributions up to $100 from individuals," Backer said. "But he won’t, because Democrats are utter hypocrites on campaign finance." Neither the Markey nor the Lynch campaigns responded to requests for comment.